More than 7,000 Twitter posts by 1,600+ different users generated almost 28 million impressions during this week’s Content2Conversion Conference in Scottsdale, Arizona. For three days, the resort at Gainey Ranch became a genuine B2B content marketing bonanza. From opening night festivities on the Lawn Court, to the closing panel session, B2B content wishes, wisdom and wit was shared among the more than 400 conference attendees and their social media audiences. 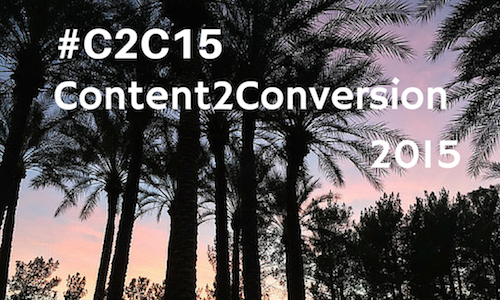 Excellent opening night festivities for #C2C15 – Well done @content2convert ! I spent as much time as I could soaking up sun and conversation outside between sessions in the mid-70 degree weather before returning home to 10-below. C2C was my first B2B content marketing conference, and I welcomed the opportunity to dive in and get fully immersed in the topic. As a journalist-turned-marketer, it was also refreshing to see some common themes from other areas of writing resonating throughout the conference. From Michael Brenner‘s talk on content personalization and Laura Ramos‘s insight into B2B storytelling, I brought home a deeper understanding of the emotional connection B2B buyers need to have with the content they consume. From Tim Riesterer and Karen Thomas-Smith, I learned more about how content influences buying decisions and ways to implement content-first marketing programs. Event keynote speakers included Erin Provey of SiriusDecisions, Brenner from NewsCred, Jim Lenskold from Lenskold Group. While I attended mostly the C2C (content-focused) presentations, our friends at Demand Gen Report have provided this great recap from both the C2C and Demand Gen Summit tracks. TopRank CEO Lee Odden spoke on influencer marketing, more specifically co-creating content with industry thought leaders in his presentation: Lee Odden on How to Co-Create B2B Marketing Content With Influencers at #C2C15. Influencer marketing has brought a number of marketing industry leaders together with the audiences they serve through content that is beneficial to both (more about TopRank’s award-winning influencer campaign later). Demand Gen Report also announced the fourth-annual Killer Content Awards. TopRank Online Marketing was the recipient of this year’s award in the influencer campaign category for a eBook series produced for Content Marketing World 2014. Congratulations to all award winners! 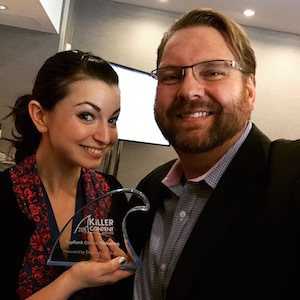 Pictured here is Alicia Fiorletta, senior editor of Demand Gen Report, with our own Lee Odden accepting the award. Congrats as well — and thank you — to the Content2Conversion group for putting on such a fabulous conference. The team at TopRank Online Marketing is looking forward to next year’s event!